2. Enter your Aadhaar number and the security code in the picture. 3. Click on 'Generate OTP'. 4. You will receive an OTP on your mobile phone. Make sure you had verified your number with the UIDAI website. 5. You will see options to choose the period of information and the number of transactions. Write your OTP and click on 'Submit'. 6. 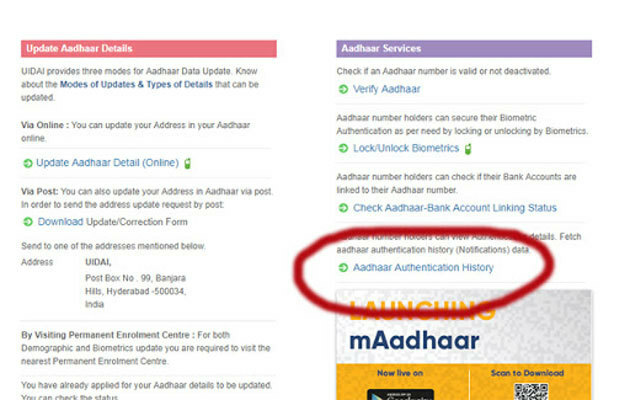 You will see the date, time and type of all Aadhaar authentication requests made in the period you had chosen. However, the page won't show who made the requests. If you find something suspicious, you can even lock your Aadhaar information online and unlock it whenever you want to use it. And while you are figuring that out, don't forget the linking deadlines are fast approaching.